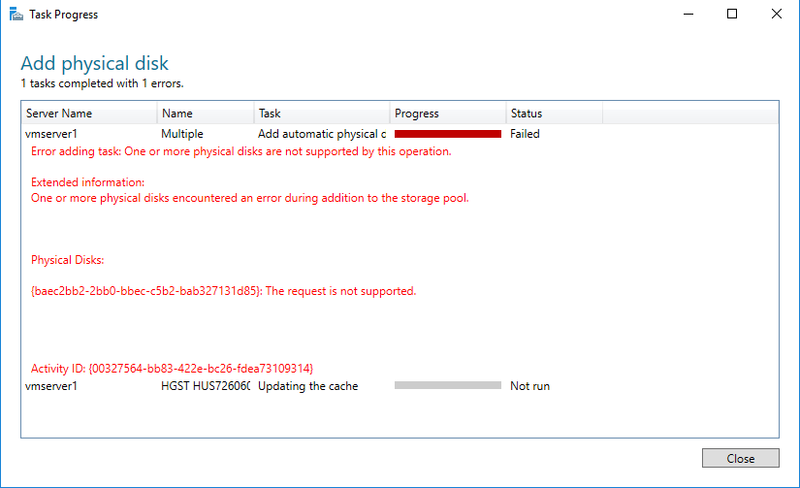 Unable to add a physical disk to a Storage Spaces storage pool but can add it to a new pool? I currently have a Storage Spaces pool with eight 4TB disks allocated to a single virtual disk in mirror mode (two columns, two copies). I am attempting to add a single 6TB disk to this array and am unable to do it in the Storage Spaces UI or through PowerShell, as I get an error message saying "One or more physical disks encountered an error during addition to the storage pool. The request is not supported." I have tried reseating the disk, restarting, etc. all to no avail. The interesting thing is that while I cannot add it to this pool, I CAN create a new pool with that disk as its sole member. While I don't believe it should be relevant, the existing pool is 8xSATA drives and this additional drive is SAS. All installed in a Lenovo SA120 enclosure connected through an LSI 9200-8E HBA. Any thoughts on why I can't add this disk, and (more importantly) if there is anything I can do to correct that? You are allowed to mix SAS and SATA drives on the same controller, however, you are not able to mix the two into the same array. This is why your attempt to establish the SAS drive by itself was successful. Not the answer you're looking for? Browse other questions tagged storage-spaces or ask your own question. Windows Storage Spaces, can I stripe across 3 disks and on top mirror to a 4th disk?